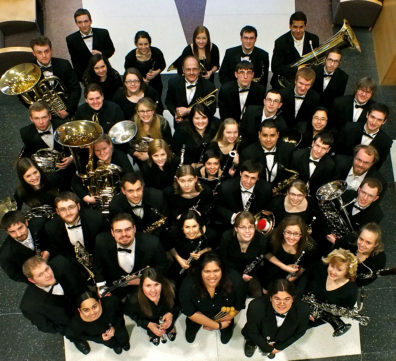 The WSU Symphonic Wind Ensemble is comprised of finest wind and percussion players in the entire university. The ensemble is committed to performing the finest wind band repertoire and is constantly seeking to perform newly commissioned works by today’s finest composers. Like all WSU ensembles, the Symphonic Wind Ensemble provides rehearsal and performance experiences that will assist students in their preparation for careers as performers, teachers, composers and lifelong practitioners of music. Develop group performance skills in the areas of intonation, blend, balance, phrasing, articulation, and rhythm. Develop awareness and execution of proper stylistic and performance practices of original wind band repertoire ranging from the Classic to Modern periods of music. Develop excellent habit of preparation and rehearsing as a member of a performing ensemble. Develop concert performance abilities that include artistic execution, poise, focus, and etiquette. Learn basic elements of composing from contact with living composers and the writings of the past. Develop a greater awareness of higher artistic standards through contact with guest artists and performances at professional conventions. Learn a sense of camaraderie that develops from supporting and working with other musicians. Learn the ability to interpret physical gestures of various conductors and transfer those gestures into musical sounds. Critique and review live performances in written format. Gain awareness and acceptance of the variety of roles that exist within an ensemble and the ability to carry one’s own role. DANH PHAM is Assistant Professor of Music and Director of Bands at Washington State University. He conducts the Symphonic Wind Ensemble and serves as the Coordinator of Instrumental Music Education within the University’s School of Music and liason to the College of Education.Originally from Honolulu, Hawaii, he received his degrees from DePauw University, Indiana University, and the University of Oklahoma, where he studied conducting with Ray Cramer, Stephen Pratt, and William Wakefield. Prior to his appointment at Washington State University, Pham held similar posts at McMurry University, Western Oregon University, Salem-Keizer Public Schools, and the Beaverton (OR) School District. 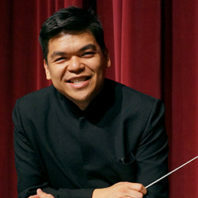 Pham has appeared as a guest conductor and clinician at several region honor bands throughout Texas, the Midwest, and the Pacific Northwest. His ensembles have appeared at the Oregon Music Education Association State Conference (twice), the MENC Biennial Northwest Conference, the National Association of Teachers of Singing (NATS) Southwest Convention, and the Texas University Interscholastic League State (UIL) Marching Contest. Pham has been part of several commissioning projects, including those of composer Kevin Walczyk. He was an integral part in organizing Walczyk’s Symphony No. 2 “Epitaphs Unwritten” which was recently awarded the National Band Association William Revelli Memorial Composition award. Pham is also a contributing Research Associate for the Teaching Music Through Performance in Band series released by GIA Publications. Contact: Dahn Pham with any questions.